Mutual support (2 guns up front). 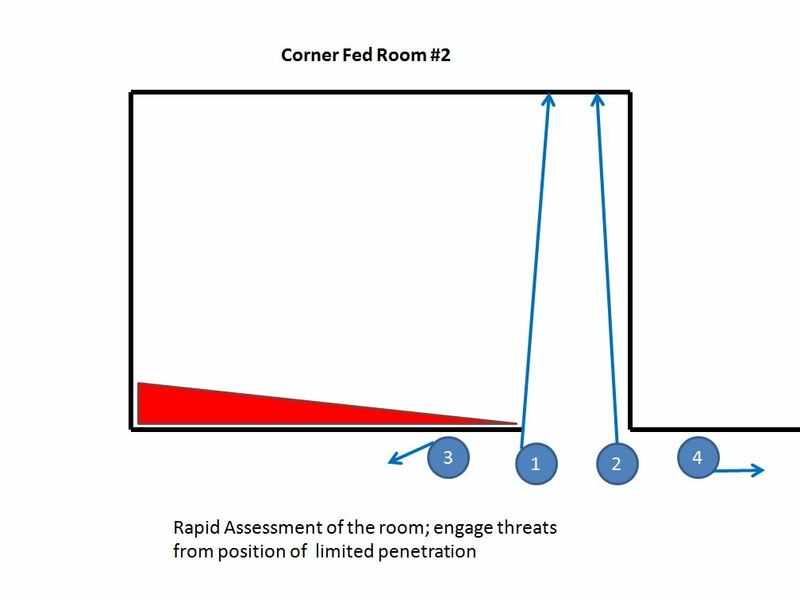 Limited penetration in order to observe and engage. 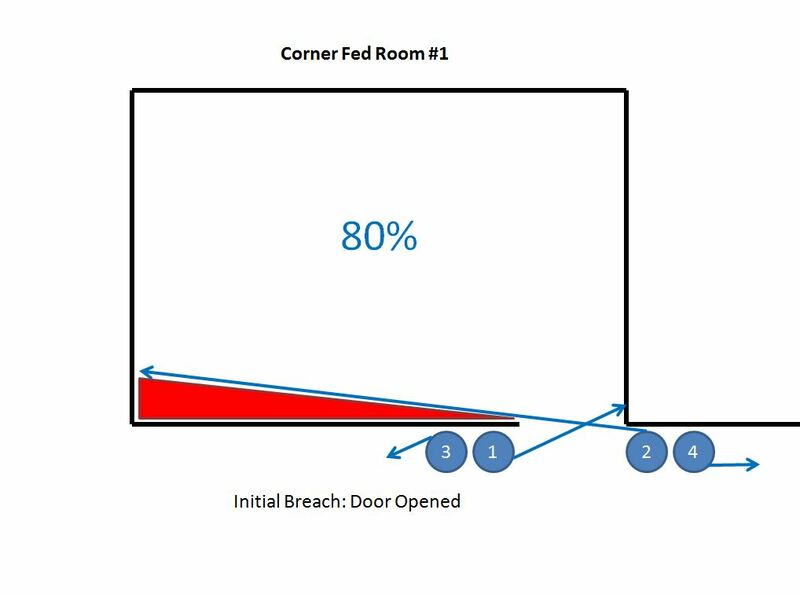 Observe 80% of the room before entry. 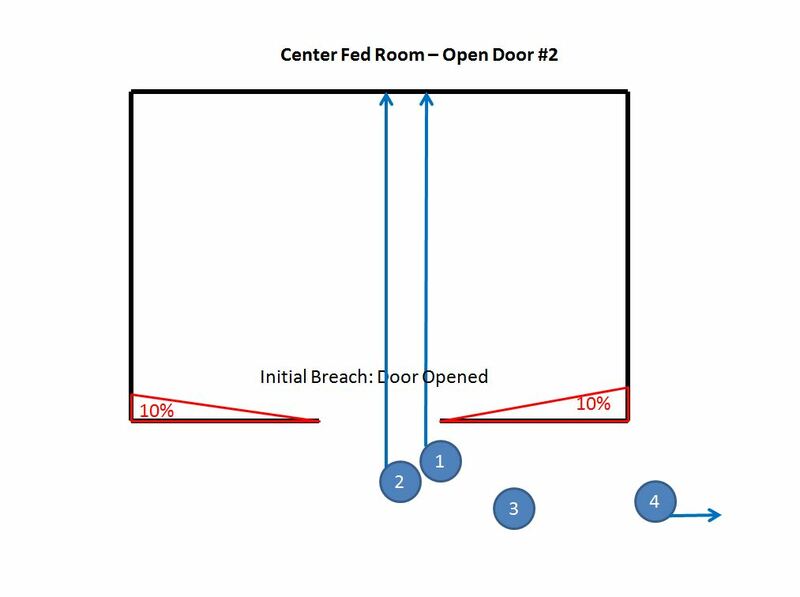 Two men enter simultaneously/slight offset (factors of door size/operator size) and immediately get guns on the remaining near corners – back to back button-hook. Use of the high/low technique. On call commands to adapt to changing situations. 2 front men mutually supporting, number 2 offset and slightly back from number 1. Number 3 = Team leader. Number 4 = Breacher (if required) and rear security. Number 1 slices the pie to begin to get eyes down the opening, stepping left as he corners. Number 2 steps out left from beside Number 1 and completes the corner/steps across the gap if there are no threats to engage. If applicable, number 3 covers down the corridor they were originally moving down. 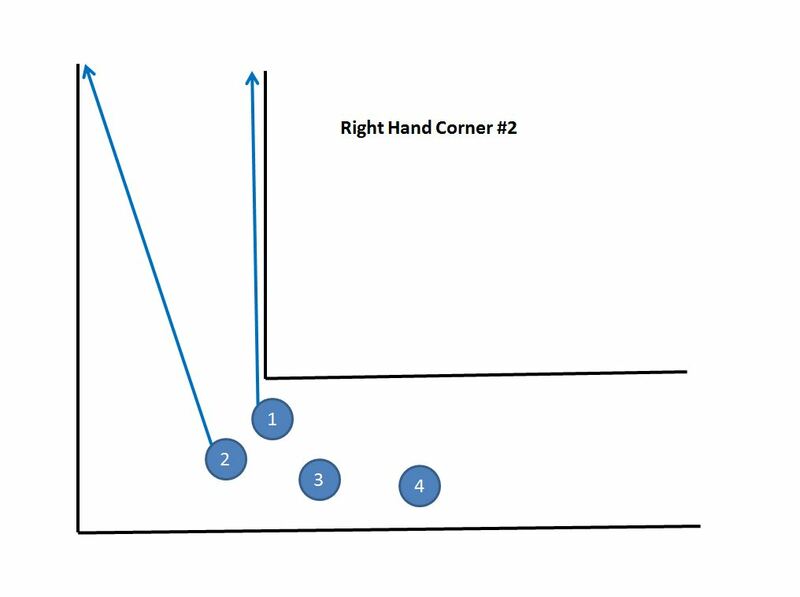 Number 2 active muzzle awareness, if he crosses behind number 1 due to a change in direction/corner direction, he drops his muzzle and then brings it back up on the new side. Offside shoulder technique used with weapons when cornering on support side. Opposite, Number 2 comes out on the right. Number 1 and 2 corner in opposite directions. Number 3 and 4 step out left and right respectively . It’s just a double corner. Team continues in desired direction, Number 4 pulls rear security. 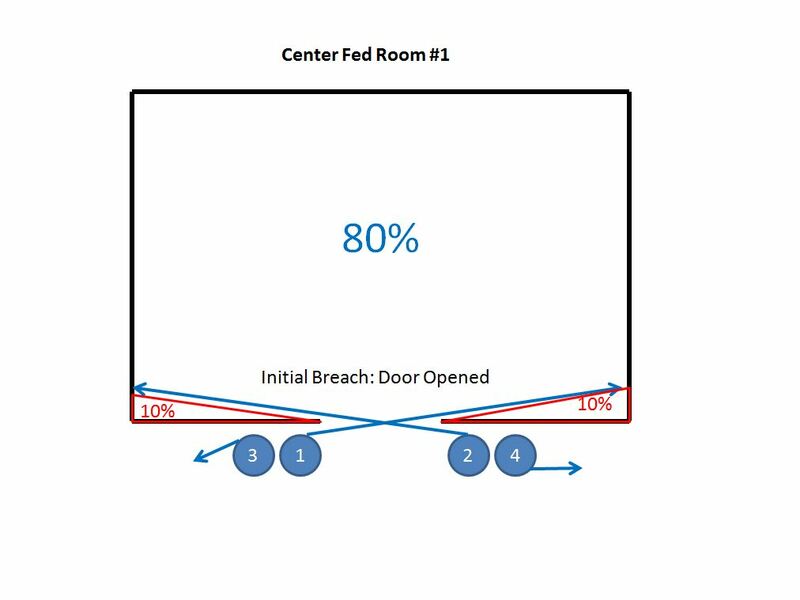 Split breach point if possible, team split on either side of the door (door closed only). Number 1 and Number 2 split either side of doorway. Number 3 and 4 also split, providing security – cover up and down the corridor or external as appropriate. 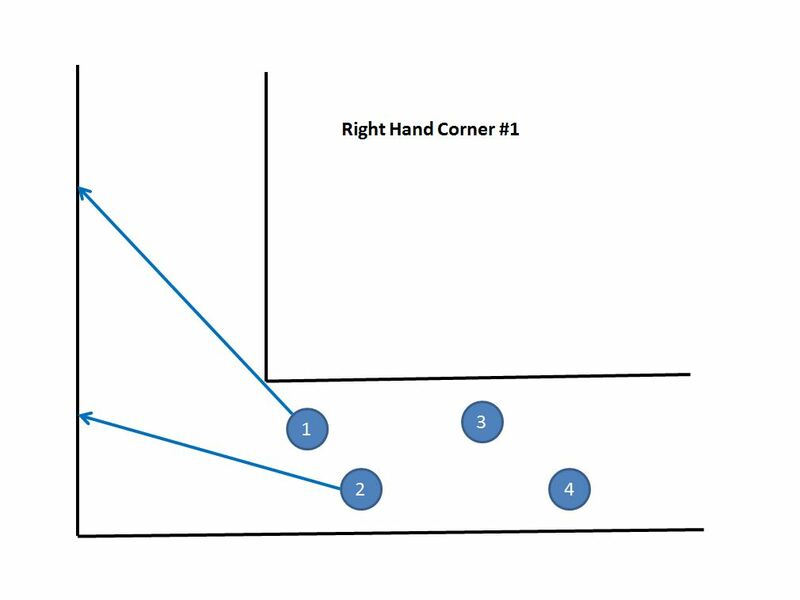 Number 1 & 2 are immediately covering from their opposite near corners (minus 10% unobservable each side deep in the near corners) through opposite far corners to center. Don’t initially flag weapons into the room! 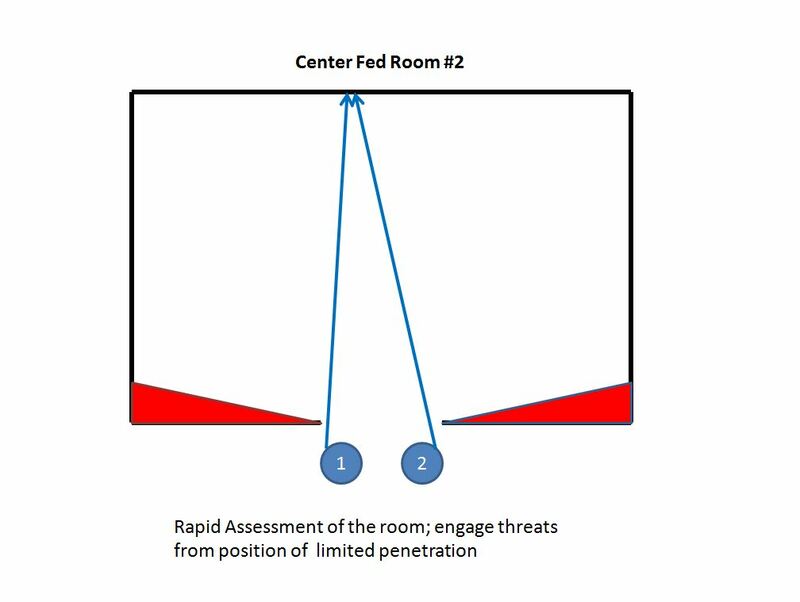 Number 1 & 2 engage any threats and observe situation in the room. As they move their muzzles into the center of the room from their opposite near corners, slicing the pie on the door corners, they sidestep into the doorway. Simultaneously if there is space (doorway size? 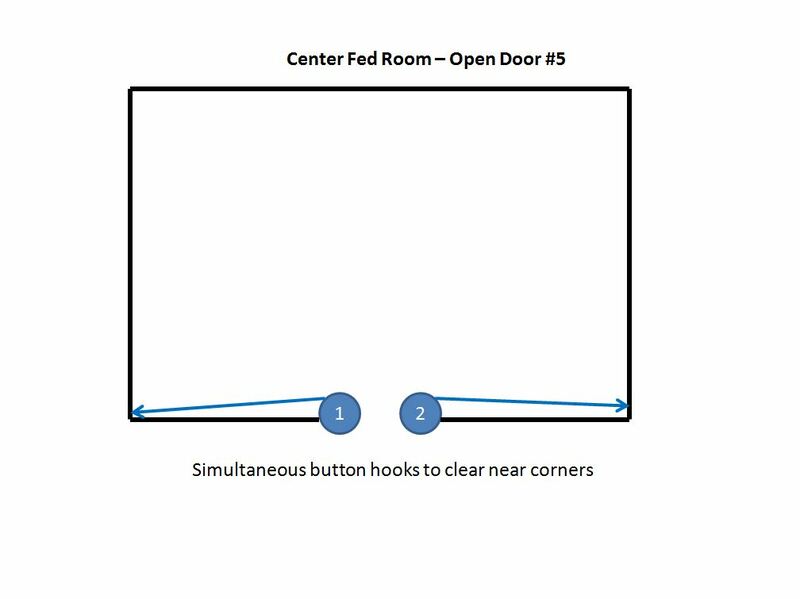 ), or Number 1 fractionally ahead if there is not, they step into the door and button-hook back to back into their near corners. ‘Quick Peek’ and ‘high/low’ techniques can be used to view the near corners as appropriate. Number 1 and 2 push into the room a limited distance – not ‘running the walls’ – followed by number 3 (team leader). 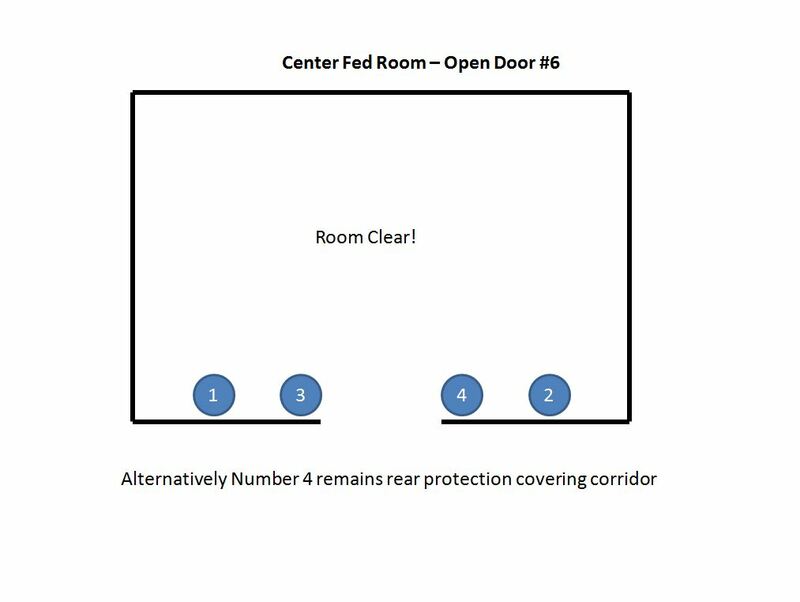 Number 4 covers rear, will remain in corridor/room until called in if they are moving into another room and not back into the corridor/out through the original room. 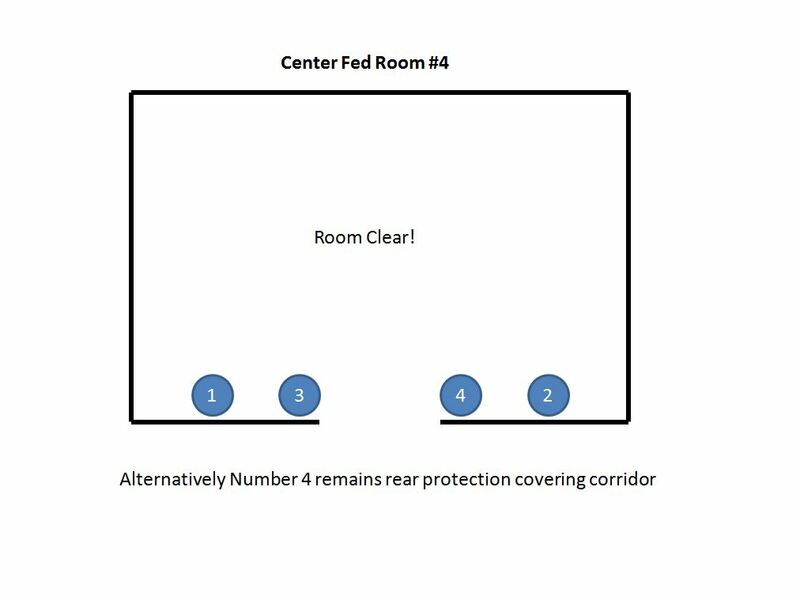 Same as center fed room. Depending on the side of the near wall, either number 1 or 2 will have a limited field of view. Only one near corner will be an issue. 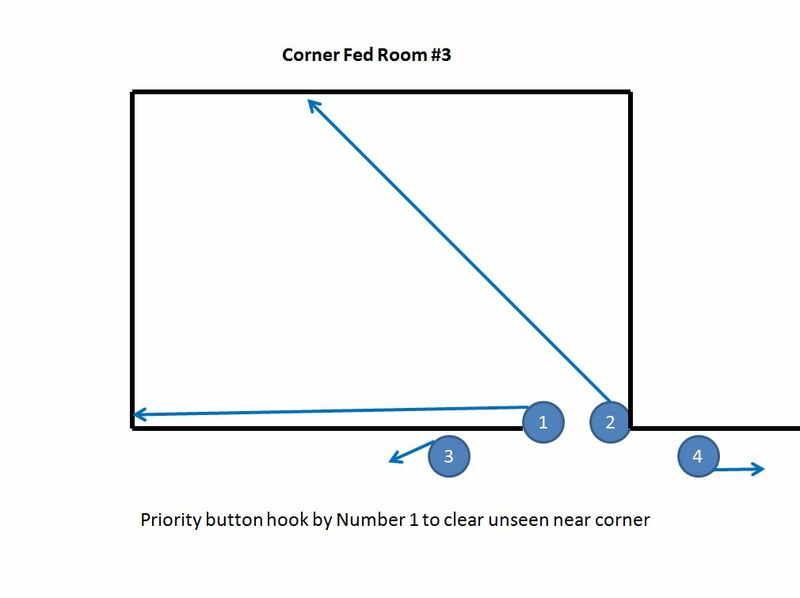 Depending who has that near corner that operator will be the one to button hook first, getting eyes on the unseen near corner. Other operator number 1 or 2 immediately follows and moves along the near wall to support his buddy. 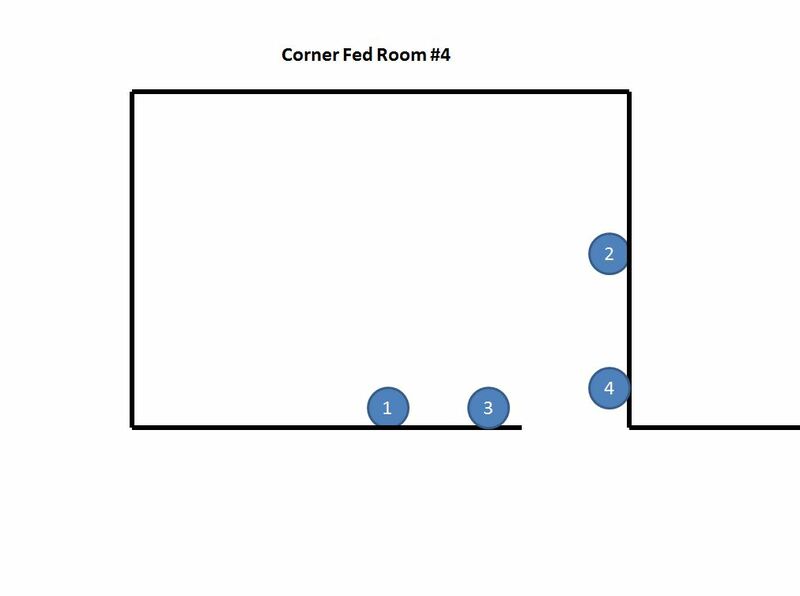 This situation is like a corner, but there is more space beyond it, due to the center fed room i.e. it’s not just a change in direction of a corridor. We cannot be split either side of the door, because it is open and that will expose us crossing the doorway. Approach as per a corner, number 1 covering into his opposite near corner. Number 1 corners, sweeping his muzzle into the center of the room as he side steps. 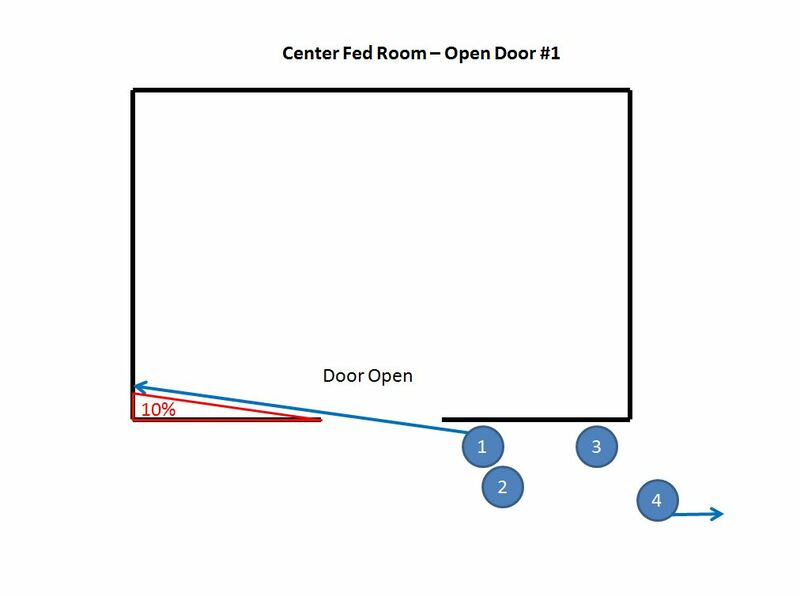 Number 2 comes up on the left, steps into the entrance, and continues to corner into the right side of the room and his now opposite near corner. He ends up on the other side of the doorway. Number 3 is covering down the corridor, Number 4 pulling rear security. 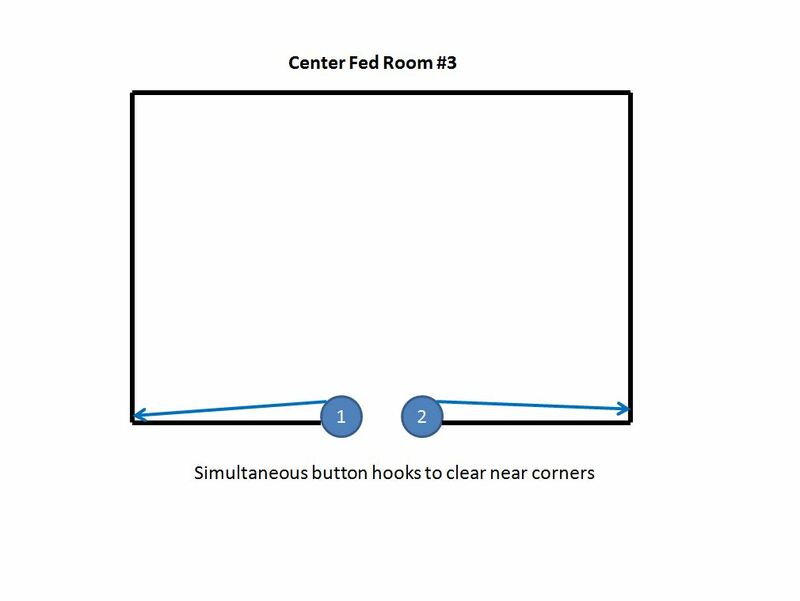 Once both near corners (minus 10% unobservable) have been covered, including 80% of the whole room, Number 1 & 2 simultaneously (or slight offset) button-hook into their respective near corners. Any threats that come into view are engaged prior to making entry. Decision whether to enter or stay back is made. The rest of the drill is as per a door closed. An alternative, if he has it, is for Number 1 to pie the whole entrance, getting to the opposite side of the doorway, number 2 taking over his original position by the door, then Number 1 and 2 continue as per the same drill. 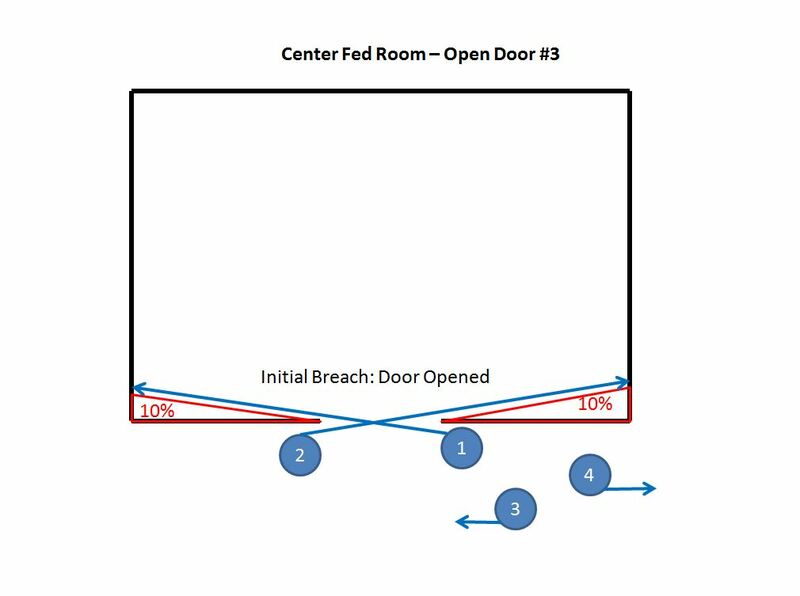 There are alternatives about how to cross the open doorway – only expose yourself if cornering correctly with muzzle up, and not flagged into the room. E quem é que te disse que não vi? Quanto ás imagens, tudo certo, existem varias teorias e todas elas estão certas. Falta a parte em que o bot ve pelas paredes,dás a curva e ele ja descarregou meio carregador, então mandas uma flash e tu é k ficas cego. Quando acordas...tas morto. Depois vem outro,mata o bot ,mas ha outro bot na casa ao lado que dispara pela janela e fura a parede.🤣acho que descrevi a totalidade dos cenários cqb arma 3 😁. @TMaster lá continuas tu com essa das paredes... eles não fazem isso. Se por acaso fizerem é porque a "parede" não é realmente uma parede e a casa/mapa está mal feito. Mesmo que disparem para a parece muito poucas dão para furar sem ser as de chapa ou madeira. Sequência das figuras da 3ª,4ª, 5ª , nas entradas, o resto é conversa.